Still hand wrapping your pallets? It’s time to upgrade to a Wulftec stretch wrapper. Not only does the SML-EXT help cut down on material and labor costs, it also improves the safety of your packaging line. 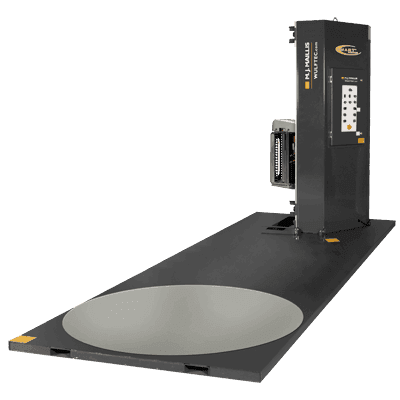 With a low-profile, extended turntable base, this semi-automatic pallet wrap machine easily accommodates your long and wide pallet loads. Available features include a UL 508A-approved control panel, spring loaded carriage gate, wrap height extension and washdown motor. No matter your needs, Hughes can help you customize your semi-automatic stretch wrapper to your exact specifications. To learn more about the Wulftec SML-EXT Semi-Automatic Turntable Stretch Wrapper, give us a call at (609) 337-3641 or request a quote online. The factory certified technicians at Hughes Enterprises offer 24/7 on-site maintenance and support. So, whenever downtime strikes, you know who to call to get your packaging line back up and running. Contact us today to discuss your needs with a member of our team.